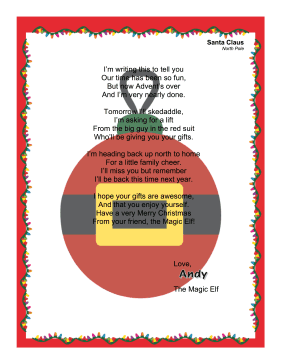 Perfect for kids who like the story Elf on the Shelf, this letter is from Andy, the Magic Elf, when he leaves to go back to the North Pole on Christmas. And I'm very nearly done. Who'll be giving you your gifts. For a little family cheer. I'll be back this time next year. And that you enjoy yourself. From your friend, the Magic Elf!